The weekend is a time to lounge, relax and enjoy the flavours we may be too busy for during the week. Some of us may not want to think about leaving our cozy beds on a chilly Saturday or Sunday morning, but these delightful brunch options may just convince you otherwise. You could travel to Ireland for a hearty brunch, but why bother when you can pop over to Durty Nelly’s for a mirrored experience. Enjoy a flight of beer as you feast on their “Full Irish Fry Up”, including eggs, bacon, sausage, ham, black pudding, roasted potatoes and more! This dish and the many others that Durty Nelly’s offers will make you drool and surely won’t leave your stomach grumbling. The Grand Banker Bar & Grill has a mouthwatering weekend brunch menu! Try their Breakfast Poutine with hand-cut hash browns, local sausage, hollandaise sauce, green onion, a sunny side egg, and of course lots of fresh cheese curds. To top it all off, make sure to pair it with their Ceasars. Sugar Moon Farm‘s brunch can be summed up in two words – “maple inspired.” From Irish Maple Coffee to the Sugar Moon Classic, involving buttermilk pancakes served with maple baked beans and your choice of local sausage or bacon, their brunch options will leave you going nuts for maple! This is the perfect option for any brunch lover with a sweet tooth. The Kiwi Café is the perfect destination for both early risers and those of us who like to sleep past noon. From 8 a.m. to 5 p.m. an assortment of breakfast options are available with international themes, interesting flavours and the freshest of local ingredients. Enjoy avocado toast on sourdough bread and then indulge in some of their homemade baked treats too! Rose and Rooster Bakery is a small café that brings a lot of flavor! Whether you’re enjoying an Eggs Benny or a Chorizo Burrito you can rest assure the fresh ingredients have been sourced from local farmers and producers. Want more local? Rose and Rooster Bakery serves Nova Scotia roasted coffee and espresso. The Union Street’s share plank is a hearty platter perfect for two. With french toast, fishcakes, molasses baked beans, hand-cut homefries, bacon and sausage, free range eggs, with fresh fruit. A meal so delightful it almost guarantees a second date! The Governor’s Pub & Eatery takes a traditional brunch dish and makes it so much better by adding seafood! 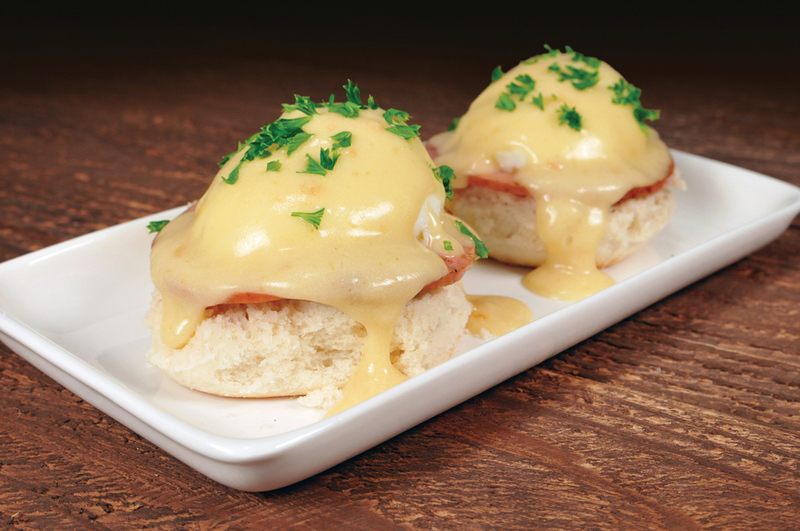 Their Lobster Eggs Benny includes poached eggs on a biscuit, fresh lobster, hollandaise and home fries. Perfect for seafood lovers.